TPU found some new benchmark results of the GeForce GTX 680 over at Asian tech site HKEPC, you can check it out over here. The numbers reveal the GeForce GTX 680 is a tad faster than the Radeon HD 7970. 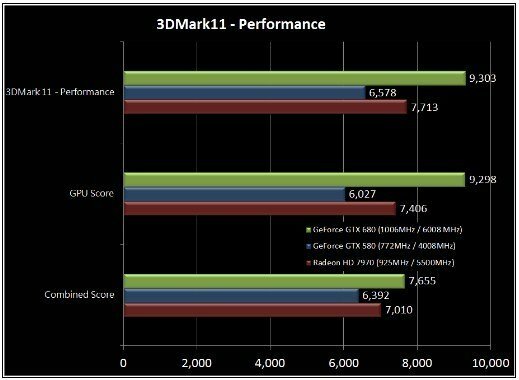 For skeptics who refuse to believe randomly-sourced bar-graphs of the GeForce GTX 680 that are starved of pictures, here is the first set of benchmarks run by a third-party (neither NVIDIA nor one of its AIC partners). This [p]reviewer from HKEPC has pictures to back his benchmarks. The GeForce GTX 680 was pitted against a Radeon HD 7970, and a previous-generation GeForce GTX 580. The test-bed consisted of an extreme-cooled Intel Core i7-3960X Extreme Edition processor (running at stock frequency), ASUS Rampage IV Extreme motherboard, 8 GB (4x 2 GB) GeIL EVO 2 DDR3-2200 MHz quad-channel memory, Corsair AX1200W PSU, and Windows 7 x64.